Hidalgo and his cowboy bring an old story to life in a new epic adventure. 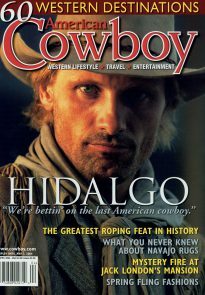 Both cultural and colorful standouts, Hidalgo and Hopkins (Viggo Mortensen) bring to audiences the “cream” of cowboy character. It may prove to be a bit of an irony that in a day and age when the word “cowboy” is bandied about carelessly, even derogatorily, that the recently released Disney film Hidalgo courts a message to the contrary—and, we think, a rather well-received message: cowboys are good guys, and what they represent can be found worldwide in men who love horses. Starring Viggo Mortensen, Zuleikha Robinson, and Omar Sharif, Hidalgo, scheduled for release March 5, was directed by Joe Johnston, produced by Casey Silver, and written by John Fusco, whose screenwriting credits include the animated film Spirit: Stallion of the Cimarron. Filmed on location in California, Montana, South Dakota, and Texas, but mostly in Morocco, Hidalgo’s titular star is a horse by that name. 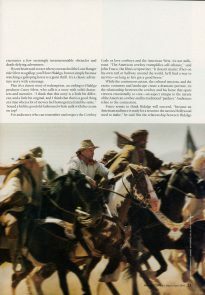 Essentially, Hidalgo tells the fact-based story of American cowboy and long distance endurance rider Frank T. Hopkins and his Paint Horse, Hidalgo, who travel to the Middle East in 1890 to compete in the centuries-old Ocean of Fire, a 3,000-mile horse race across the Arabian Desert—a race for survival traditionally restricted to the purest lines of Arabian horses owned by the country’s most aristocratic, royal families. Against these elite equines and their antagonistic Bedouin riders, Hopkins pits his mustang Hidalgo—and himself—for not only money but also personal pride and honor, and along the way, they encounter a few seemingly insurmountable obstacles and death-defying adventures. If your heart used to race when you watched the Lone Ranger ride Silver at a gallop, you’ll love Hidalgo, but not simply because watching a galloping horse is a giant thrill. It’s a classic adventure story with a message. Plus it’s a classic story of redemption, according to Hidalgo producer Casey Silver, who calls it a story with solid characters and narrative. “I think that this story is a little bit different, and a little bit original, and I think that that is a good thing at a time when a lot of movies feel homogenized and the same.” ’Sound a bit like good old-fashioned whole milk with the cream on top? 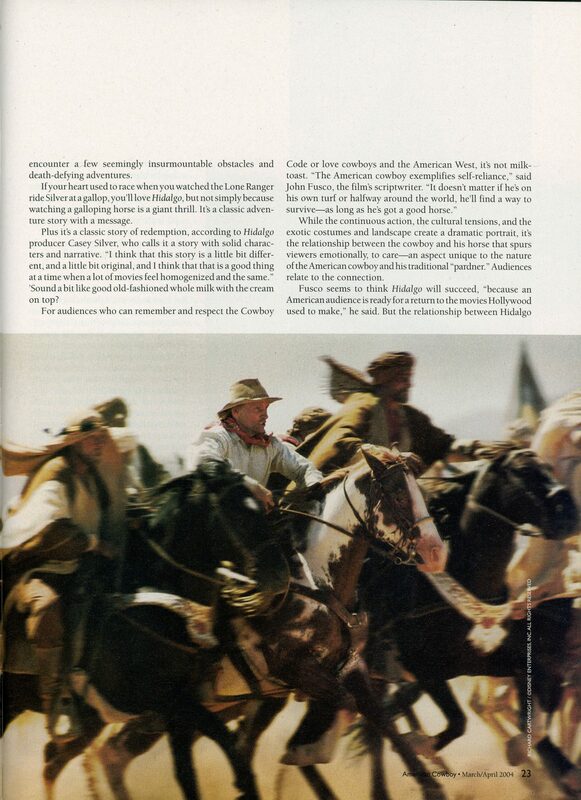 While the continuous action, the cultural tensions, and the exotic costumes and landscape create a dramatic portrait, it’s the relationship between the cowboy and his horse that spurs viewers emotionally, to care—an aspect unique to the nature of the American cowboy and his traditional “pardner.” Audiences relate to the connection. Fusco seems to think Hidalgo will succeed, “because an American audience is ready for a return to the movies Hollywood used to make,” he said. But the relationship between Hidalgo and Hopkins fuels a realism that strikes a chord with audiences familiar with the cowboy lifestyle. What may appear to be a shallow chitchat between horse and man is the basis for something deeper and more solid built by the realities of the range life. 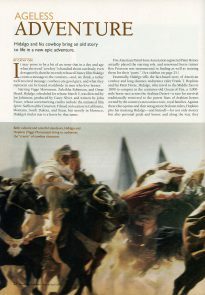 Based on an interview with Mortensen late last year by Fred Topel on HorseCity.com, Mortensen made a point to spend time with the horse stars of The Lord of the Rings film trilogy during breaks. He reportedly rode to maintain his skills and noted the calming effect they had on him after a stressful week of filming the often physically grueling scenes in the series. 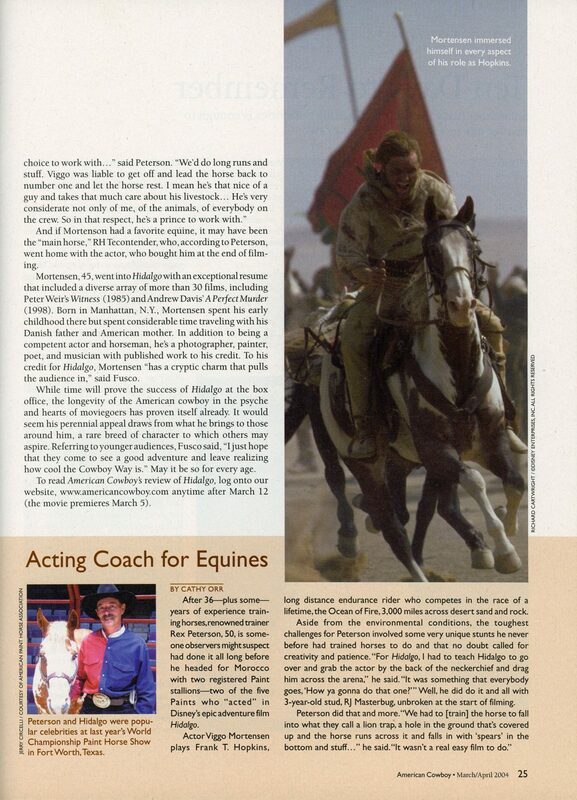 One thing horse trainer Peterson didn’t have to worry about was training Mortensen. “Viggo was a very good hand at horseback but wanting to be Frank Hopkins,” he said. “He worked very hard—you know we had seven weeks prep. Viggo was there almost every day riding. He wanted to know the horses and what he could do on each horse. Viggo was very good. You do not get that very often. And if Mortenson had a favorite equine, it may have been the “main horse,” RH Tecontender, who, according to Peterson, went home with the actor, who bought him at the end of filming. Mortensen, 45, went into Hidalgo with an exceptional resume that included a diverse array of more than 30 films, including Peter Weir’s Witness (1985) and Andrew Davis’ A Perfect Murder (1998). Born in Manhattan, N.Y., Mortensen spent his early childhood there but spent considerable time traveling with his Danish father and American mother. In addition to being a competent actor and horseman, he’s a photographer, painter, poet, and musician with published work to his credit. 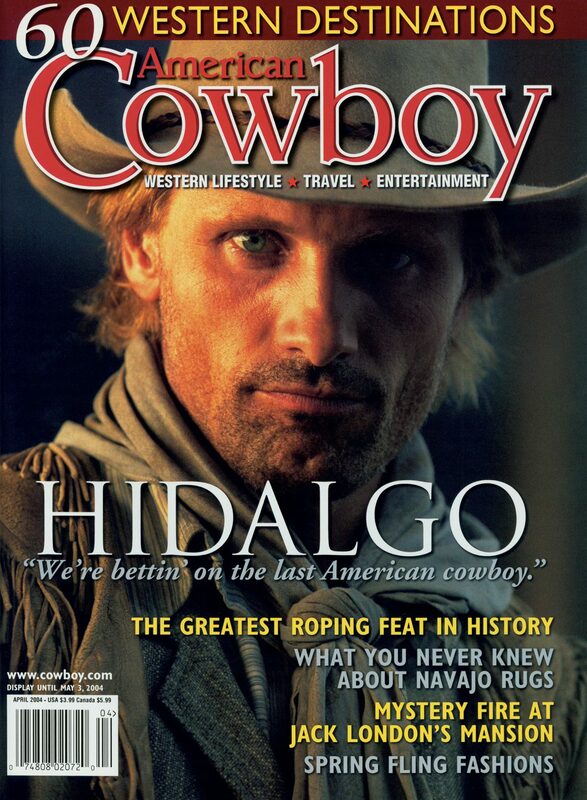 To his credit for Hidalgo, Mortensen “has a cryptic charm that pulls the audience in,” said Fusco. 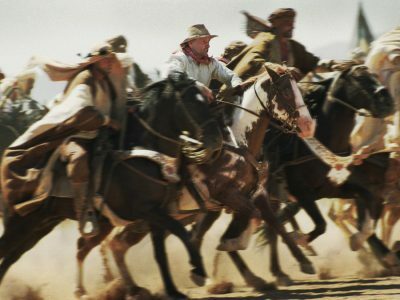 While time will prove the success of Hidalgo at the box office, the longevity of the American cowboy in the psyche and hearts of moviegoers has proven itself already. It would seem his perennial appeal draws from what he brings to those around him, a rare breed of character to which others may aspire. Referring to younger audiences, Fusco said, “I just hope that they come to see a good adventure and leave realizing how cool the Cowboy Way is.” May it be so for every age. 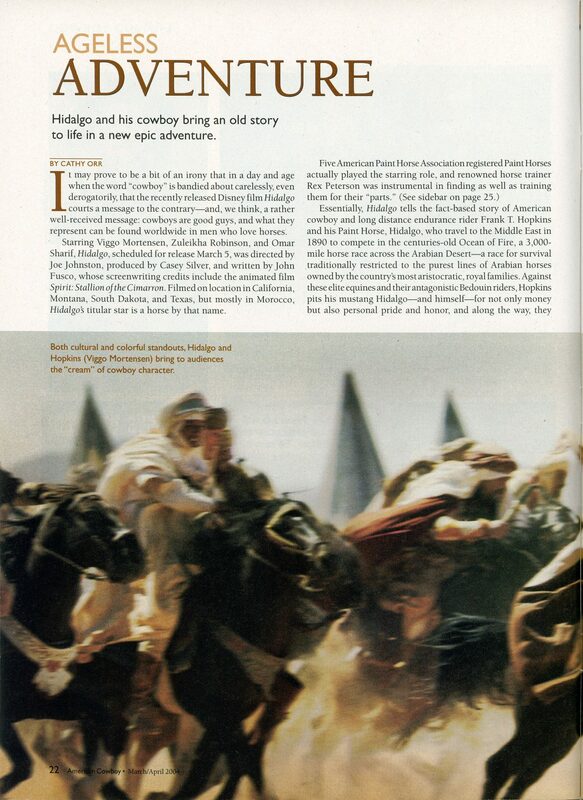 After 36–plus some–years of experience training horses, renowned trainer Rex Peterson, 50, is someone observers might suspect had done it all long before he headed for Morocco with two registered Paint stallions–two of the five Paints who “acted” in Disney’s epic adventure film Hidalgo. 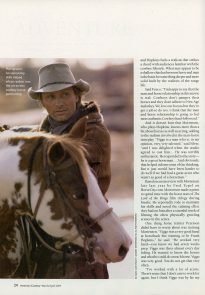 Actor Viggo Mortensen plays Frank T. Hopkins, long distance endurance rider who competes in the race of a lifetime, the Ocean of Fire, 3,000 miles across desert sand and rock. 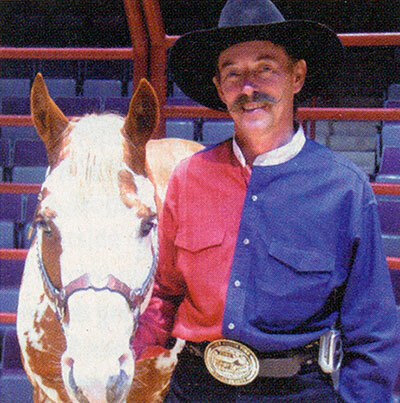 Aside from the environmental conditions, the toughest challenges for Peterson involved some very unique stunts he never before had trained horses to do and that no doubt called for creativity and patience. 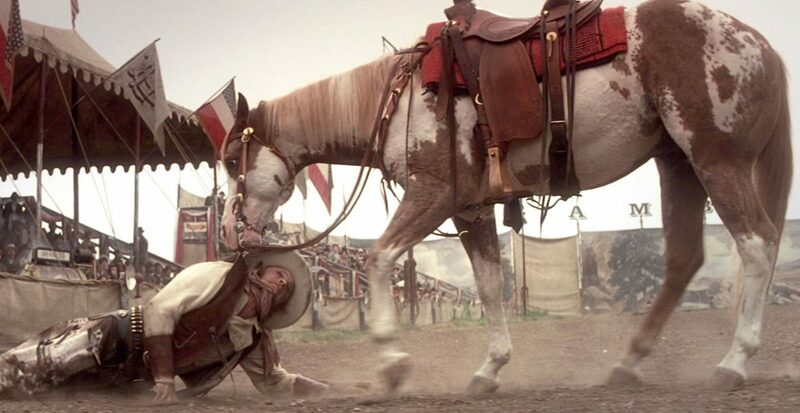 “For Hidalgo, I had to teach Hidalgo to go over and grab the actor by the back of the neckerchief and drag him across the arena,” he said. “It was something that everybody goes, ‘How ya gonna do that one? '” Well, he did do it and all with 3-year-old stud, RJ Masterbug, unbroken at the start of filming. Published March 2004 in American Cowboy magazine. Notes: Photos by Richard Cartwright / ©Disney Enterprises Inc. All rights reserved.